sirturms 1 year, 8 months ago. Lineage OS for OnePlus One has now arrived via an UNOFFICIAL build. 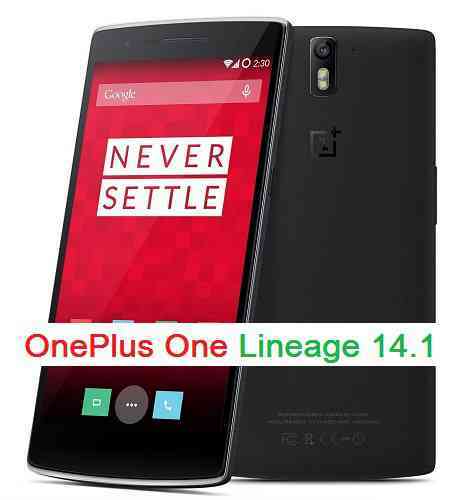 Also LineageOS 15 for OnePlus One and the OFFICIAL Lineage OS OnePlus ONE 14.1 Nougat 7.1 ROM is available to download from Lineage OS official website. Check the downloads section for the download link and update procedure. If you want some more Lineage OS ROMs then stay tuned the Lineage OS 14.1 ROM collection page. Before this there was the CM14.1 for OnePlus One. This Lineage OS for OnePlus One (bacon) is brought to you by developer Okeys. If you like this ROM then do consider a donation to Okeys. THIS LINEAGE OS FOR ONEPLUS ONE IS AN INITIAL BUILD WHICH MAY NOT BOOT AT ALL. HAVE A BACKUP BEFORE FLASHING THIS AND TRY AT YOUR OWN RISK. Installing Lineage OS for OnePlus One (bacon) requires the bootloader to be unlocked on the OnePlus One (bacon) phone, which may VOID your warranty and may delete all your data. Before proceeding further you may consider backup all data on the phone. You are the only person doing changes to your phone and I cannot be held responsible for the mistakes done by you. – Here is theTWRP update guide for the OnePlus One (bacon). This TWRP recovery guide requires an unlocked bootloader on the OnePlus One (bacon). If you want to upgrade this OFFICIAL Lineage OS 14.1 on top of CM14.1 ROM without wiping data then you can refer this CyanogenMod to Lineage OS upgrade guide. Download and Copy the GApps and Lineage OS for OnePlus One ROM ZIP to your phone. First flash the Lineage OS for OnePlus One ROM ZIP from device. Then flash the GApps zip from your device memory. Reboot and Enjoy the Nougat 7.1 Lineage OS 14.1 ROM for OnePlus One (bacon). Copy the latest Lineage OS for OnePlus One ROM ZIP file to your phone. Stay tuned or Subscribe to the OnePlus One (bacon) forum For other Android Nougat ROMs, Lineage OS 14.1 ROMs, other ROMs and all other device specific topics. Don’t forgot to add the thread here. Thanks for the link. Actually I searched for the link when I wrote the post but unfortunately haven’t found at that time. Official Lineage 14.1 download link has been added. Let me look around for a possible root cause and a solution for this error. – If you don’t want to go for a smaller GApps solution then I will suggest you to re-partition the system partition and try once more. – I have also noted that you have noticed 1300MB of free system space after ROM installation (correct me if I am wrong here). I will suggest you to make a system partition of 2GB or more. – If you still face the problem then try a different Custom Recovery and try re-installing the GApps. Hi, nice post. But I need help please!!! After flashing the device (Oneplus One) it keeps in a rebooting loop. I flashed the lineage-13 and the open_gapps-arm-6.0. Btw, I had to delete the device checking from the zip because I got the error 7. I also tried with the linage 14.1 and gapps 7.1, same result. Any clue how to arrange it?